Get our Amazon #1 best selling book plus the bonuses and offers. What if your marketing could attract leads on autopilot and you could kick your advertising addiction forever? Written for time-starved business owners, entrepreneurs and marketers who are sick of pouring money into advertising and crossing their fingers, Web Marketing That Works is your step-by-step guide to building a web marketing asset that generates revenue, appreciates in value and compounds over time. Drawing from over a decade of experience in the marketing trenches, Adam Franklin and Toby Jenkins reveal the truth about what works on the web. If you’re looking to master social media, conquer content marketing and attract customers online, this book is your blueprint. 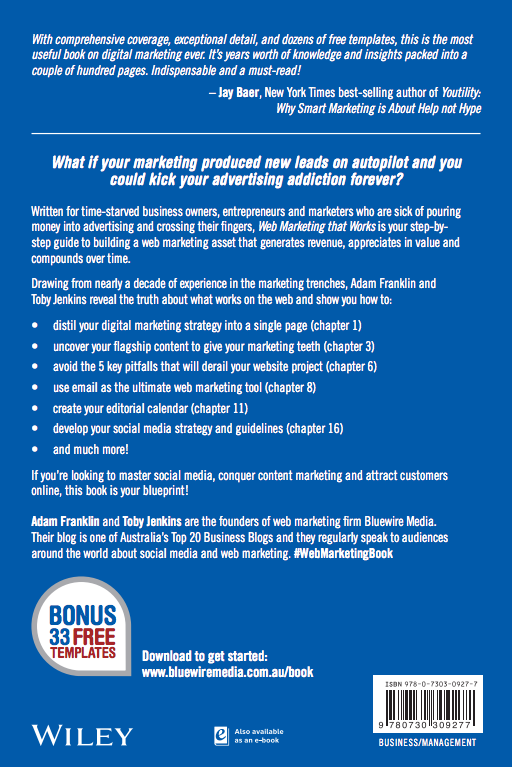 With over a decade in the marketing trenches of their own business Bluewire Media, Adam Franklin & Toby Jenkins reveal the truth about Web Marketing That Works. 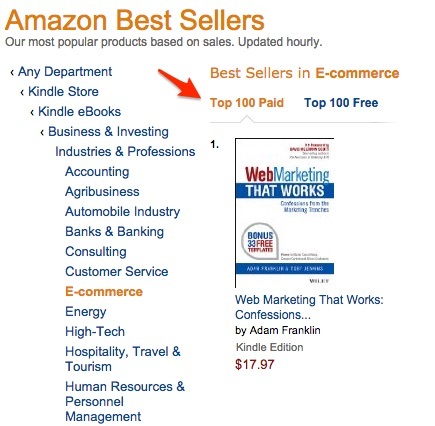 Web Marketing That Works: Confessions from the Marketing Trenches by Adam Franklin & Toby Jenkins is an Amazon #1 best seller. If you’re employed as a marketing professional, then this book is for you. You will learn what needs to happen and how to implement. Adam is a marketing manager himself. If you own or run a company and want a no-nonsense explanation of how to succeed online, this is for me. We are business owners ourselves and Toby is our CEO, we’re not authors who sit on the sidelines! If you help your clients with their web marketing, this book is your complete guide. Read the book, download the templates and use all the material with your own clients. If you want to work in any of the roles above and kick start your career or business, this book will be very valuable. Yes. Or so we are told by some industry experts and students alike. Here’s some unsolicited praise that we were emailed. Have you already downloaded and started using our 33 free marketing templates? Hopefully you’ve already experienced significant value first hand from the templates, and you are excited by what our paid, premium material can deliver. Anyway, if you’ve found the templates useful, now you are going to find our premium material valuable too. “Adam and Toby ‘get it’.” – Jeff Bullas, author Blogging the Smart Way and #11 Forbes Social Media Power Influencer. Our blog has been named one of Australia’s Top 25 Business Blogs for the last 4 years and was #1 in 2015. We’ve written for Startup Smart, Sydney Morning Herald, The Australian, Smart Company, Hubspot, Convince and Convert, ProBlogger, LifeHacker, Orbit Media and many more. We’ve been interviewed on radio shows 2UE, ABC, 4BC plus many of iTunes most popular podcasts like Entrepreneur on Fire and $100MBA. Inbound marketing software giant Hubspot recognised our company with the award for the “Most Inbound Leads – International” with 5,617 leads in one year; the most out of all Hubspot’s international partners. Bestselling author and keynote speaker David Meerman Scott has written about co-creating the Web Strategy Planning Template with us in classic marketing book, “The New Rules of Marketing & PR” (page 154). Between us, we have been trusted to speak at over 100 conferences to tens of thousands of people. We run our own annual events with other renowned industry leaders speaking in the lineup. We were contracted by the publisher Wiley to write our first book called Web Marketing That Works: Confessions from the marketing trenches” and this is the course to help you implement everything. Our weekly ‘Bluewire News’ email newsletter goes to over 27,300 marketers all over the world, and this number grows every day. Many marketers have enjoyed our private workshops which cost $1000+ a ticket, and corporate clients have engaged us for private consulting which costs as much as five figures a day. This offer is your chance to access all the same IP that we share in these workshops and you can go through it at your own pace. As always, we completely stand behind our products. If you change your mind, don’t like it, or have even the slightest hesitation that you’ve not got massive value within 60 days from your date of purchase, we insist on respectfully refunding your money to your credit card! No guilt, no stress and no worries ;-) Plus you keep the book so can pass it onto a friend who might find it valuable. Email us and your money is refunded to your credit card or PayPal account. We won’t make you feel bad, ask to see your homework or interrogate you about what you implemented. Just make sure it is within 60 days of when you paid for the material. We trust you. People might abuse this guarantee! Why on earth would we do this…? Reason 1: Firstly, we want you to achieve your goals and if our book and material doesn’t deliver, you shouldn’t be out of pocket. However we are totally confident that you’ll love the book and find the courses very valuable! Our money is where our mouth is. Reason 2: As for the scallywags who might pinch the book… People who deliberately steal courses by knowing in advance that they’re going to milk the refund, aren’t actually customers at all, so we simply choose to focus on serving people like you who will hopefully be a customer for life. Reason 3: Finally, if you’ve bitten off more than you can chew right now or you get cold feet, we want to support you. And the best way we can do this is to reimburse your investment, and wait until you are ready. This guarantee is extended for a full 60 days, which completely covers the time you need to read the book. If you don’t love it, like it or find it remotely valuable, just email us WITHIN the 60 DAYS and we’ll fix you up. Just please don’t ask for a refund after the 60 days is over. To keep it fair to all students we must keep our word and say no if you ask. So let’s both avoid having the awkward and uncomfortable situation of us having to saying no. The 60 day period starts when you make your purchase! We hope you understand. Does that sound fair? Ok, that’s our promise to you. So, now hop along and join the rest of the marketers who are taking action right now! Web Marketing That Works BOOK: A physical copy of the book shipped anywhere in the world. 5 Bonus Videos: The Truth About Social Media for Business, Killer Digital Strategies, How to Cold Email Any VIP, How to Start Grow and Monetise a Podcast, The Power of Content Marketing. Access to our private Facebook group for readers like you. What do I get in the Web Marketing “All Access Starter Pack”? 8 of Adam’s most popular and keynote presentations, covering the most important web marketing fundamentals. This is exactly what we teach private clients and in workshops around the world. What book bonuses do I get? You get the full length 53 minute recording of Adam Franklin’s keynote presentation to 600 mortgage brokers. In this private 69 minute webinar recording, Adam and John discuss how to connect with influencers via email and social media. John Corcoran is a former speechwriter in the Clinton White House and relationship expert. John Lee Dumas from Entrepreneur on Fire teaches his practical 60 minute podcast training workshop. Adam Franklin is interviewed about content marketing as part of the Get More Done in Business Series. We are students of web marketing ourselves. Ever since we started our business journey, we’ve been keen students of marketing and social media. Every year for over a decade we’ve invested thousands of dollars to learn from people who are doing what we’d like to be doing. This way we’ve been able to fast track our journey. We’ve put together a robust framework that’s been stress tested on the marketing frontline. We’ve synthesised all the best information out there, so you get the stuff that works. This is good news for you, since you’re busy, you have your own expertise and like us, you’re happy to pay to fast track your learning from people you know, like and trust. This material contains exactly what we wished we’d had available to us when we started our business in the mid-2000s. Whether you choose the book on its own, or the blueprint or the entire course, you’ll be taking a giant step in the right direction with your web marketing. So why do people fail? 1. They have no clear goal. If you don’t understand and define who you want to buy from you, anything you do on the web will lack direction. You’ll burn time, money and lose motivation. Fast. 2. They don’t have a consistent nurturing process. Without a systematic approach, any success will be unlikely, random and unscalable. With the right nurturing process you can guide a new lead to become a customer over time. We’ll teach you what to do. 3. They don’t take action. This is the major one. Putting what you know into action is honestly where most marketers fall over. They get busy or distracted by the next shiny object. This course will show you how to develop and implement your plan. And we’ll be around to help you get the results you want. For starters, 95% of websites we see make one easy-to-avoid mistake. What is that….? Many marketers don’t really appreciate that the majority of your website visitors are craving information. And instead of delivering this useful and interesting content, they inadvertently rush, pressure and cajole visitors to the enquiry form or the Buy Now button. It’s like proposing marriage instead of asking someone on a date. You may be repelling your best customers! On their first visit to your website, people are nowhere even close to picking up the phone, filling in your enquiry form or whipping out their credit card. They don’t even realise you can solve their problem until you EDUCATE them with free yet valuable content. The critical thing you can do to overcome this is… release a piece of flagship content. It should be so good that people would actually pay for it. Then with the right lead nurturing process, you’ll have pre-qualified prospects coming to YOU to do business at the prices YOU want. No cold calling, no advertising and far fewer tyre kickers! This is just the tip of the iceberg of stuff you learn from our book and material. Yes — it includes a physical copy of the book, shipped anywhere in the world. Plus you get all the bonuses. No. You have lifetime access. Yes. The price you see today will definitely increase. No, all updates are included. The good news for you, is you’ll get all the future updates for free. Yes. In fact we will most likely add updates and new content to this material. No. Just time. Our philosophy is to help you build a web marketing asset, rather than get you hooked on advertising. What we mean by that is we’ll teach you how to invest in things that you own and that live online forever and appreciate in value. In contrast, social media advertising depreciates fast. In fact as soon as your adverts have been clicked or displayed, they vanish and you need to keep on pulling out your credit card every time you want more. This is painfully addictive and expensive. We won’t lead you down that path. I run an agency, will I learn enough to add this material to my offering? We want to see you move through this program successfully, because it’s in your best interest and ours. We are here to help. So if you have any questions, get lost, feel overwhelmed or feel like giving up, please let us know directly. We’re here as your lifeline, cheer squad or whatever you need! Ok that’s it from us! It’s proven that most people actually read these PS’s so if you’ve scrolled down this far and are truly considering putting your well laid plan into action, we urge you to do it. Please text Adam on +61 424 329 132 or adam.franklin [at] bluewiremedia.com.au if you have any pressing questions. Thank you for making it to the end. You’ve heard everything from us, and by now you should have a good idea whether our material is right for you. So really, it’s decision time ;) Whatever decision you make, we’re sure it will be the right decision for you right now. We hope to see you in the learning centre soon.